We’re under a winter storm warning for snow, sleet and freezing rain, 90% starting this evening. The sheep are not concerned. They’ll stand out in the middle of it all in their woolies. Last year their fleece weighed in between 5 and 10 lbs. each and spins into beautiful yarn. 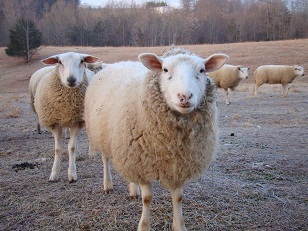 It’ll be shearing time before they know it, and they’ll spend the remaining days of winter near the barn. Until then, they’re just fine, thank you. Previous Little Visitor Next Don’t Jump! I’m so excited to see that you have a blog. I remember the suggestions on Craftster, but I never knew you started one. I completely caught up and have subscribed via Google reader.